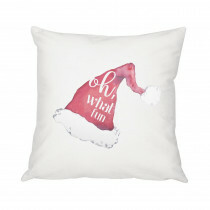 Create a traditional holiday look in your home with the Oh What Fun Santa Hat Throw Pillow. With a fun and charming Santa design, this pillow features a polyester insert and a soft cotton covering. Give this joyful pillow as a gift or keep for your own cozy space at home.